If you're playing on PC, it doesn't matter since you can plug them straight into USB (with an adapter sold by Fanatec). However, with consoles they have to be used with a Fanatec wheel unfortunately. Hi thanks for reply Are Fanatec CSL Elite pedals compatible with a Logitech or thrustmaster wheel, or has it got to go with a Fanatec wheel? Fanatec CSL Elite pedals have adjustable load cells on the brake and are reasonably priced, then Fanatec Clubsport if you want more features (worth it). Anything above this is serious enthusiast kit such as Heusinkveld which will cost you a small fortune. can you buy good pedals anywhere that are preassure sensitive without need for modding? You didn't tell us to specifically watch the saw parts of the video. Again, how many car thieves carry a saw? Nothing will stop someone taking your car, you have to make it a longer / more difficult / noisier job for them. Well known fact. Full of ebay locks, was there a stoplock in that video getting ripped apart? It's about putting people off, your average car thief doesn't carry a saw around with them. I use the pro elite version, it's not getting ripped off by anyone other than the hulk. Don't the crooks just saw through the steering wheel with these types? The ones that cover the entire steering wheel are better. I have one of these that I haven't used in 20 years but thought you needed the key to lock it ? That's brilliant! E: op im not having a dig buddy. Just made me smile and wanted to share that. Yes we are. Only way to stop new cars getting nicked. Aye forgot about that they are even selling pouches to put your key in to stop the signal being transmitted. No need for OBD, all you need is an amplifier to boost the signal from the keys on your foyer table to the car. A few friends I know who have keyless entry cars use these - these have definitely made a comeback. Autotrader rates this version as the best steering wheel lock https://www.autoexpress.co.uk/accessories-tyres/95031/best-steering-wheel-locks Says 5+ minutes to remove, and tools needed etc, will stop a chance thief, but more of a deterrent to a dedicated gang, hopefully slowing them down long enough to stop the theft. He or she doesn't own the key, it's just hidden evidence. Yes.... but where did you put that key? Honestly i thought it would be a pain, but i push my seat back unhook it and place it in the passenger footwell, after a few goes it isn't actually annoying and my car is keyless entry and start. It is heavy i must admit, but your car won't go anywhere. Just make sure when car is parked at home and your out, leave the key home (or visible) as like my brothers last car scumbags broke in found the car keys and took the car (it had no lock then). If you lose the key and can wait, then Dislock assuming you kept the key code sticker will provide another. Yes, I’ve already changed my PIN from the default one. Friend had his x5 stolen just last week. Within an hour the tracker and connected services were disabled/removed/destroyed. Just been reduced from £129.99, great price! G29 for PS3 + PS4 and G920 for Xbox One, both work on PC. I actually bought one of those as well but it has a wobbly wheel and makes a squeal sound turning left neither of which was described. I also got a Casio watch described as having two scratches and a damaged box and I received a completely unmarked new one just with a broken seal on the box. Luck of the draw I guess! Got the same, was listed as "used very good", but on arrival its immaculate and just missing the original box. Happy days! Cancelled my 128.99 order in time as well. That's 50 quid towards the frame thingy. Missed out but they've got used like new for £81 after marketplace discount! Just got one, still more in stock. No shifter required as it has paddle shifters behind the steering wheel. No. It has flappy paddles on the wheel. Shifter is if you want to use manual with the clutch pedal. I have this! Bought a couple of months back for £60 (a steal!) from Shpock because I didn’t know if I’d use it often enough to buy brand new. Last time I used a wheel was back in the late 90’s and they’ve definitely come a long way. Definitely worth picking up if you’re into driving games and want to enhance the experience, but I’d recommend purchasing a seat of some kind, or at least figure out how you’re going to use it; I know that sounds stupid but if you’re sat in your front room and have nothing to mount the wheel on because your ironing board has limited height adjustment then you’ll soon stop using it! I went for the challenge play seat (folds away) and the setup is good enough for me. Obviously if you’re PC gaming you’ll probably be at a desk of some sort. Anyway, heat! Ive gone for this over the G29. Son is looking for a wheel for christmas, so this looks the best option at the moment. I've ordered it for click and collect and can always return it if there is a better option later in the week (if the G29 comes down a lot mainly). Cheers OP. That is exactly it. All your buying with either product is a joy con holder that gives some partial feeling of driving with a steering wheel. I don't realky recommend myself, almost nobody uses wheels even when they own them. In stock for collection at my local, anyone know if there is a difference between them and these: Nintendo Switch Joy-Con Wheel Pair, other than the look and shape? They just cut the steering wheel and leave the crook lock on the drive as a big thank you. Good old "Krook Lock" comes to mind. Remember that? Old video but still applies even to this day: Locks are only as strong as their weakest link, in this case it's the steering wheel. If you drive a manual and own a sought-after car I would highly recommend putting a lock on the clutch pedal. 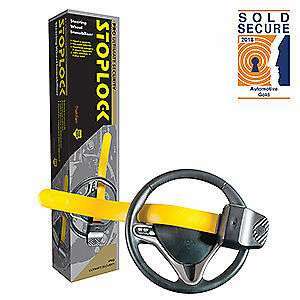 Honestly I always chuckle when I see a steering wheel lock, it's like a fluorescent yellow advertisement: "please steal me". Never miss a 'Steering Wheel' deal again! Streetwize Baseball Bat Steering Wheel Lock Ideal for all your security needs! And if you feel the need doubles as a baseball bat! These are pointless and can be broken into or sawed off within minutes. 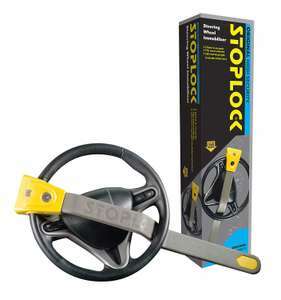 The only worthwhile steering lock to get is the Disklok. Granted it's around £100 but if you're serious about security and your car is an expensive one, then that's what you need to get. They take atleast 10/15 minutes to get off. Was going to buy one identical to this recently due to upgrading to a keyless car however opted for one from aldi which i cant fault at all. Its a Solid heavy lock and luckily reduced to a tenner when i went to collect instore. Its no longer on their website however i purchased instore about a week or 2 ago so you may be able to get if your looking for a quick option. Yea but the Police arent stupid. Can you even buy a Logitech G29 steering wheel without the pedals? Companies don't usually have "+ Pedals" in the product titles so I find it odd people may think it's not included. Heat added. Heat added.....as the foot pedals ARE included. Since slightly nasty cold votes on this I think? Cars with more than 6 gears don't have H type shifters anyway. That's why you have paddles behind the wheel. H shifter is for road cars, paddles and sequential shifter for racing cars. He was referring to the fact that the submitter said that he wanted to buy it for his kids and nougat gave his own experience in the matter that he did the same with his kids and they didn't appreciate it. Given that the wheel is expensive, I think having some extra insight is a good thing. You can get about £150 for a used one with Gearstick, after all fees. That's when fvf offer is on. I would also agree this is not the best Wheel mainly due to gear driven feedback which can be harsh at times however at around this price this is one of the best wheels to buy for starting out Sim racing as they are very well made and hold their value really well so if you decide you don't like it just sell it without losing too much. Would definitely recommend a playseat challenge if you want a full setup and your just getting into Sim racing. Good luck and I hope you enjoy your Sim racing experience! Great deal and you won't have to deal with Dixons. Toys R Us were given the rights to sell it for a short while before Xmas. What type of game is this is it like Mario kart battle mode? Doesn't look as good as the other console versions, but it's passable. Paid £11.99 on eshop sale, DLC was £3 a pack, but they're just cosmetics for me. Got a few cars on the Xbox version and don't use any. I don't see a deal tbh. Not voting though, I'm sure some see value. I got this launch day digitally for £15 from the Nintendo eshop. Not the collectors edition but I was really pleased with the price as switch stuff is usually inflated in price. I paid £45 for doom for example when it’s a tenner on xb1 etc but playing it portably is epic ! I totally agree. I just disputed that physical Switch games cost twice as much. The let's face it here is if cost is your issue then you should be playing on a PC ahead of ANY console. Seeing MK8 v.3 (aka Mario Kart 8 Deluxe) is fairly disappointing, seems worth posting this alternative racing game, now out to buy on physical cart. People here appear to be trying to compare this with Forza or Gran Turismo. I understand the price being too high but the User Score on MetaCritic is a 7.3 and it looks decent for a racing game on the Switch. Freezing. Rubbish price. Would bite at maybe £3.99 on eShop. Thanks ordered earlier when available orzly stuff is usually good quality aswell. Shows as £18.79 for me, are you missing the 1 from the price in the deal? Only hassle with these wheels is the shocking reliability. 50.50 if you get one that lasts a few years or not. Thrustmaster customer service is also shocking. Shame because performance wise the T300 is simply superb. The T3PA pedals you get with the GT and Alcantara Editions of the T300 are superb. The brake mod is also included and that's a complete game changer. Exactly what it says. Use code logitech25 at checkout to get 25% off. Online and reserve for instore collection. I can't use force feedback with a g29 on an Xbox though right? I have a g29 but looking to swap for g920....but if I can use it properly including forcefeedback......oh hold on looking at the instructions there has to be a pc in the mix also? I got mine for 74 pounds.Thanks to Nectar points. What gaming wheel do you use instead?